CCM RBZ 80 Sr Goalie Skate | Sports Etc. Quarter: Vectorwear surlyn. Highly reactive outer shell with added reinforcement for instore heat activation. Core: Customizable EPP Foam. 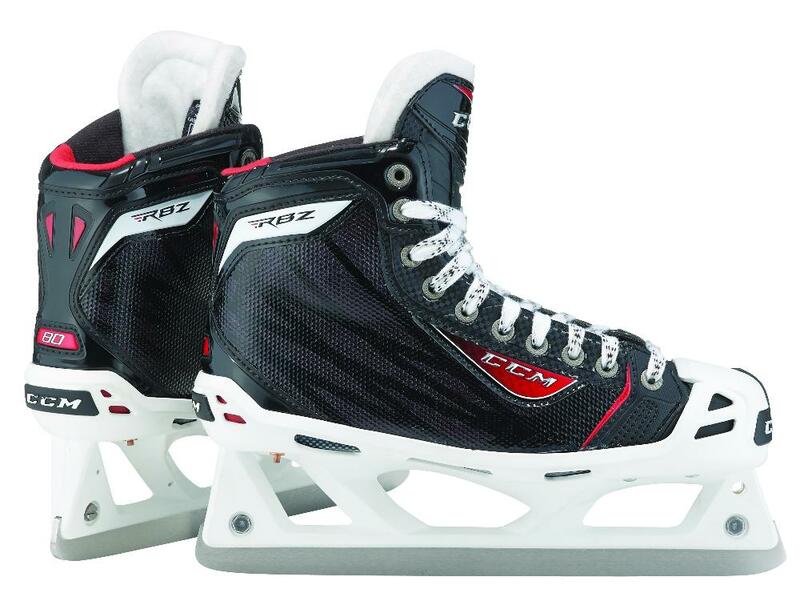 The most heat moldable core offered in CCM skates. Liner: Heavy duty microfiber. Created for added comfort with durability for extra wear in mind. Midsole: Surlyn midsole. Provides a good structure for blade interface. Footbed: Anitomical response. Good comfort. Tongue: 7mm felt + foam tongue with added lace bit protection. Comfort and added protection for lace bite. Ankle padding: High density Poron memory foam. Long lasting fit and comfort. Cowling: Prolite G with Carbon impact inserts. Light weight with increases recovery angle for quicker recovery to the set position. Toe shield: Added toe and heel protection Prolite G Stainless. Provides superior edge life for long term performance. The CCM RBZ 80 Goalie Skate contains an ultra light cowling, which is designed for a fast recovery from post to post. The Prolite cowling offers an aggressive push off angle, which has become increasingly popular among goalies today. An advanced composite quarter package provides pro level stiffness to maximize your foot’s reaction speed and explosiveness in tight situations. The ankle pads contain high density Poron memory foam for added comfort and stability.